The 25th anniversary of the Waimea Cherry Blossom Heritage Festival has a full lineup of free, multi-cultural performing arts and hands-on demonstrations, plus over 150 crafters and food booths on Saturday, Feb. 3, 2018 from 9 a.m. to 3 p.m.
Festivities are at various venues sprawling through the town’s center—look for pink banners identifying site locations. New to the festival is the Cherry Blossom Express—a Disney-themed “train” for small children offering rides at Church Row Park by Clarence and Gloria Yee of Hawi. Festival parking is available at Parker Ranch Center, the soccer field across Church Row Park and along Pukalani Street. Festival shuttles offer free transportation among most venues 8:30 a.m. to 3:30 p.m. by Roberts Hawai‘i, though walking is encouraged among venues. A map of the shuttle route and festival venues is available in a detailed festival program available at each venue location. Organized by members of the upcountry community and the county’s department of parks and recreation, the festival marks the blooming of the historic cherry trees at Church Row Park and celebrates the age-old Japanese tradition of hanami, which translates to ‘cherry blossom viewing party’. After a seasonal winter chill, the trees typically are blooming in early February. The 2018 event artwork is Celebrating the Bloom by Waimea artist Anna Sullivan. 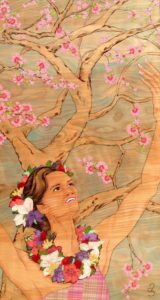 Her original mixed media wood piece will be for sale—and appears on a limited number of $10 collector posters—at the Waimea Arts Council’s Firehouse Gallery. Sullivan will be present to sign purchased posters during the festival. A quick rundown of festival activities at various locations follows (times are 9 a.m. to 3 p.m. unless specified otherwise). Schedule is subject to change. Historical Cherry Tree Display: Waimea Lions’ Club offers a pictorial history of the cherry trees and serves as the festival’s official Lost and Found station. T-shirt sales. Entertainment: 9:30 a.m. to 1 p.m. Hula, Japanese dance, koto music by Darin Miyashiro, taiko drumming, lion dance. Bonsai: The Waimea Bon-yu Kai Bonsai Club offers a display and sale of bonsai, ongoing demonstrations and a clinic to discuss and work on the art of bonsai. Cherry Blossom Express: Train ride for small keiki. Asian Collectibles/Food Sales at Kamuela Hongwanji: Browse Asian-themed collectibles, cherry blossom crafts, plus Asian foods: Inari sushi, nishime bento, chichi mocha and andagi. Cooking Demos/Entertainment at Kamuela Hongwanji: 9 a.m. to noon, Kona-Kohala chefs offer cooking demonstrations with free samples, lion dance. Origami instruction at Kamuela Hongwanji: Hands-on fun with Kikuko Kibe. Open House at Kamuela Hongwanji: Rev. Shingo Furusawa explains Shin Buddhism rituals. Festival Entertainment Stage: In the back parking lot. Opening 9 a.m. dedication ceremonies kick off continuous entertainment until 3 p.m.: Bon Odori Taiko, Hula Halau Ka Noeau with Kumu Hula Michael Pang, Lion Dancers, Ira & Boy Varize, Darlene Ahuna and Patio Productions. Craft Fair: Nearly 150 crafters inside Center and in the back parking lot. Mochi Tsuki Pounding: Help pound mochi using 500 pounds of rice with the Kona Hongwanji Mission outside the Fireside Food Court starting 10 a.m.; samples. Tea Time: In the lobby: Mauna Kea Tea provides tastings of Hawaii-grown and Japanese teas with local tea maker at 10 a.m. and 1 p.m. Performing Arts: On stage: Koto player and teacher Darin Miyashiro at noon; Shizuno Nasu of the Spiral Vision Company bringing traditional music and dance from Japan and the Cosmo Orchestra peforming the Sakura Shumphony, 1:30 to 3 p.m.
Ka Hui Kapa Apana O Waimea Quilt Show: Display by six generations of quilters in the family of club president Cyndy Martinez; sewing novelties and craft fair. Japanese Collectibles: View a display of kimonos and collection of kokeshi dolls, plus learn about the 1840 Spencer House. 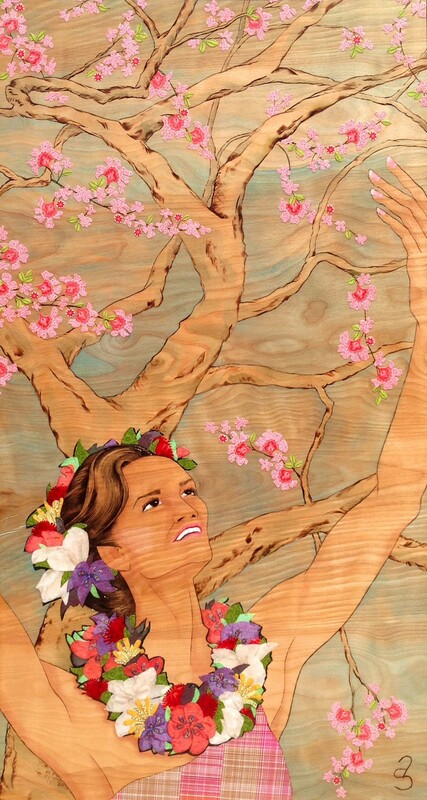 Firehouse Gallery Activities: Waimea Arts Council presents cherry blossom and spring-themed art, sales of $10 festival poster with artist signing, sidewalk chalk drawing for all ages and food sales. Waimea Senior Center: Cherry Bakeoff Contest at Waimea Senior Center. Entries must be submitted 8 to 10 a.m. and will be sold after winners announced at 10:45 a.m., along with other baked goods. Proceeds benefit Waimea Senior Citizens Club. Thelma Parker Library: Explore the effects of ultraviolet radiation on humans and Waimea cherry blossoms while learning how to protect objects from UV exposure during a NASA@My Library Activity 9:30 a.m. to 4 p.m.
Japanese Tea Ceremony: The Urasenke Hilo Association performs traditional chanoyu 9 a.m. to 2 p.m. inside Pu‘uopelu. Solar Scope Viewing: West Hawaii Astronomy Club and Keck provide solar telescopes for viewing the sun and answer questions. 10 a.m. to 2 p.m. Sake Tasting: Noon to 3 p.m. The Waimea Cherry Blossom Heritage Festival is produced by the Hawaii County Parks and Recreation’s Culture and Education Section. Overseen by Parks and Recreation Director Roxcie Waltjen, the festival is a community-wide effort by a dedicated team of volunteers. For more information call (808) 961-8706.